1. Press Ctrl+A to select the entire image. If you only want to apply the effect to a portion of the image, feather the selection with a radius in the neighborhood of 5 to 8 pixels. 2. Choose Filter ^ Blur ^ Gaussian Blur. Enter some unusually large value into the Radius option box — say, 8.0 — and press Enter. 3. Press Ctrl+Shift+F to bring up the Fade dialog box. 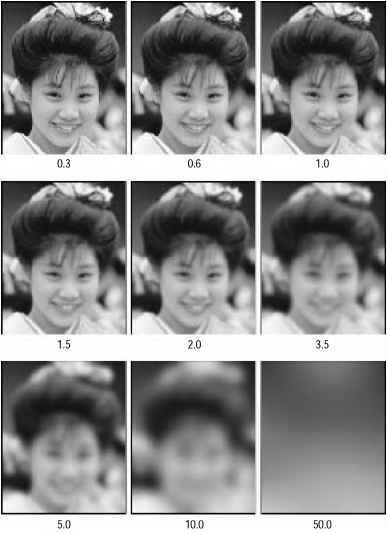 To achieve the effects shown in Figure 10-20, I reduced the Opacity value to 70 percent, making the blurred image slightly translucent. This way, you can see the hard edges of the original image through the filtered one. 4. You can achieve additional effects by selecting options from the Mode pop-up menu. For example, I created the upper-right example in the figure by selecting the Screen option, which uses the colors in the filtered image to lighten the original. I created the two bottom examples in the figure by applying the Darken and Lighten options. Figure 10-19: The results of blurring an image with the Gaussian Blur filter using eight different Radius values, ranging from slightly out of focus to Bad Day at the Ophthalmologist's Office. Figure 10-20: After blurring the image, I chose Edit^ Fade Gaussian Blur and changed the Opacity value to 70 percent. Then I applied the labeled blend modes to alter the image further. Color Plate 10-6 shows an image that's more likely to interest Captain Kirk. It shows a young agrarian woman subject to most of the same settings I applied earlier to Constantine. Again, I applied the Gaussian Blur filter with a Radius of 8.0. Then I used Edit ^ Fade Gaussian Blur to adjust the Opacity value and blend mode. The upper-left image shows the Normal mode, but the upper-right image shows the Luminosity mode. In this case, the Screen mode resulted in a washed-out effect, whereas Luminosity yielded an image with crisp color detail and fuzzy brightness values. As a result, there are some interesting places where the colors leap off her checkered dress. 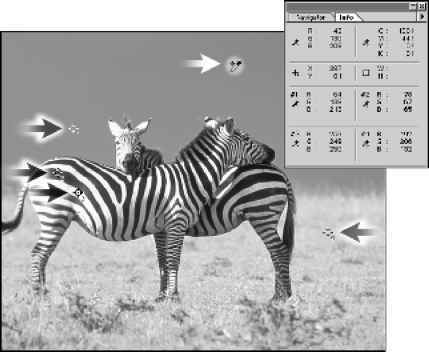 As in Figure 10-20, the bottom two images show the effects of the Darken and Lighten modes. You know, though, as I look at this woman, I'm beginning to have my doubts about her and Captain Kirk. I mean, she has Scotty written all over her.